A powerful Incendiary Grenade in your pocket, among other Ammunition, can be a big surprise for unarmored enemy in the Evolution: Battle for Utopia game. G-1 Incendiary Robbing Itinerant Merchant (1st Time) 400 , 25 , 800 (00:45:00) G-2 Frag Grenades Used (10) 320 , 20 , 640 (00:36:00) 35 , 7 , 70 (00:00:36) Same as G-1 Frag Grenade plus extra 30% delayed damage for enemies. No damage to targets. G-2 Incendiary Available only via Smuggler’s Offers (“Nuclear Mole” game) – n/a – – n/a – – n/a – Can’t produce by yourself Same as G-2 Frag Grenade plus extra 30% delayed damage for enemies. No damage to targets. G-3 Incendiary Available only via Smuggler’s Offers (“Nuclear Mole” game) – n/a – – n/a – – n/a – Can’t produce by yourself Same as G-3 Frag Grenade plus extra 30% delayed damage for enemies. No damage to targets. Stasis Got 1 from Story-line. Itinerant Merchant purchase: 1 for 500 . Gem Purchase: 3 for 149 (from 25+ ). Technology of producing is in the Core location, first hack 1500 , 35 , 2000 (02:00:00) Grenades Caught in Battle (20) 1200 , 28 , 1600 (01:36:00) 300 , 200 , 600 (00:20:00) No damage but freezes enemy for 10 secs. – Incendiary Damage. Excellent for unarmored targets (130% damage), but totally useless for armored (0%). This type of damage have 2 of 9 grenades in the game. Each Grenade Kit, contains of 6 pieces (but each Medpack Kit – 8). For the maximum damage throw grenades to the enemy in the center. Due to explosion damage will caused to all (three) enemies on the battle field. All grenade types share a cool-down timer, which prevents the use of another grenade for 20 seconds after one has been used. To keep some valuable Stasis and G-3 incendiary grenades you have during easy combats, you can tap on them in your profile screen and don’t take them to those battles. 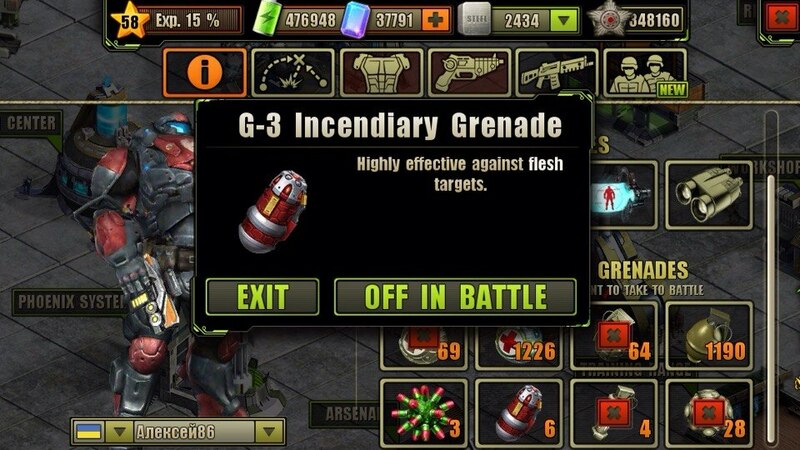 Do You Want to Take G-3 Incendiary Grenades to Next Battle? Just assuming “hard” material shell encasing a “flesh” wearer, it’s like turning up an hoven an bake whatever it’s inside. I also think there is a lack of balance between Acid, Incendiary and Energy damage, regarding either to grenades and weapons! Armored – 0% <— There is a gap here. i cant understand why energy damage should be reduced to 50% against armored … does somebody have an explanation ?? My common sense says otherwise regarding Incendiary and armored targets. If you get on fire while inside an iron made armor, basically you’re trapping the heat inside the armor. Anyway, this is just a game, so anything can happen that our imagination wants. Yep, it’s Incendiary grenades doing 0 damage vs. armored that’s disturbing even in a Sci-Fi world with its own techs and whatnot. Some amount of damage should be done, even solely on the assumption that grenades are “explosive” by definition, thus causing some sort of “shock wave” in the area they “explode”… And Incendiary frags are soo expensive. Why make them less than usefull? what do you mean by overpowered ?? If you throw 6 stasis grenades you will be invincible for 60 sec, right? stasisi frenades do not make one invincible, though it would almost have the same effect i think…but i honestly dont think there is even 1 battle where you need to use 6 stasis grenades !! I got one, but I had to rob the merchant to get it… Sheer luck, I suppose. Wow one stasis grenade is more expensive than a phoenix missile launch! is there any G-4 Grenade, if so, how powerful are they? A quick way to destroy a commander is to shoot him with an assault rifle when he starts to threaten you.